When the world's deadliest tsunami hit the southern coastal town of Tangalle in Sri Lanka on the morning of December 26, 2004, travel journalist John Maddocks was in a remote beachside cabana. He awoke from a deep tropical sleep to the roar of a 10-metre high wall of water that smashed him around the room and left him fighting for life near the ceiling. Buildings were destroyed around him and the occupants washed inland or out to sea. Thousands died in nearby towns and villages in what was later revealed as the most devastated part of the island. Few journalists witnessed, let alone experienced, this cataclysmic event. But the effects of the tsunami that killed over 230,000 people did not end when John returned to Australia. The impact of such a sudden, violent catastrophe caused acute traumatic stress. John became haunted by apocalyptic dreams and terrifying memories of nuclear-level death and destruction. A chance consultation with the trauma psychologist who treated Thredbo landslide survivor Stuart Diver became the first step in dealing with the extreme effects of the disaster. John's race to avoid PTSD, using approaches at the cutting edge of neuropsychology, became a challenging mental and spiritual adventure as he struggled with the swirling chaos of severe trauma. 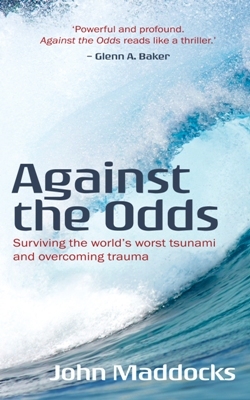 Against the Odds is a rare first-hand account of surviving a momentous natural disaster and then suffering an extreme form of traumatic stress. It is an inspirational story of resilience and transformation that offers hope to the millions of people who face trauma every year.